A PENGUIN in the JUNGLE? In the jungle there are jaguars, monkeys and parrots aplenty, but there are no penguins. None at all. 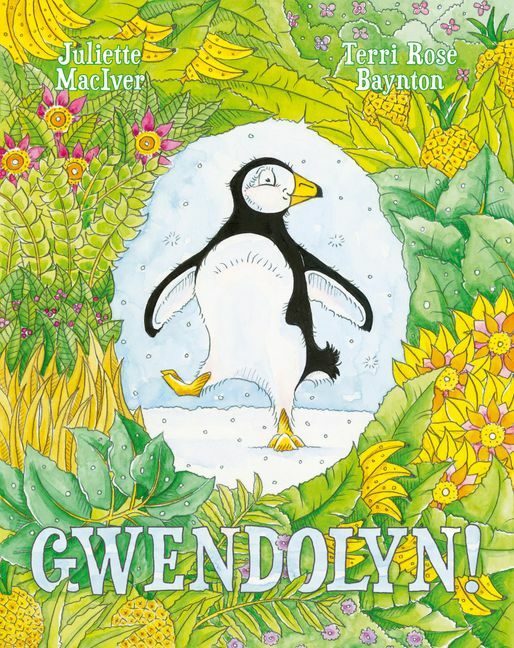 Because penguins do not live in the jungle, except for ... GWENDOLYN! A story about friendship, adventure and finding your home. Juliette MacIver lives in a seaside suburb near Wellington, New Zealand, with her husband and her live-in test audience of four children. First published in 2010, Juliette now has 16 picture books released. Four of her books have won the Storylines Notable Book Award, and six have been short-listed for other New Zealand awards, including the New Zealand Post Children's Book Awards. Her books are available in Australia, New Zealand, Canada, the UK and the USA, where one of her most recent books, Yak and Gnu, received excellent reviews in the Wall Street Journal, the New York Times and the Boston Globe. She also has five titles contracted for release in China. Terri Rose Baynton lives in the beautiful seaside town of Waihi Beach, New Zealand, amongst good friends, warm waves and a menagerie of animals. She is a scriptwriter and storyliner for children’s television, working with Weta Productions on JANE AND THE DRAGON and THE WOTWOTS, alongside her father, WOTWOTS creator Martin Baynton.